Petr Horáček has been quietly getting on with the job of being one of our most imaginative children’s book illustrators since he won the Books for Children Newcomer Award in 2001. 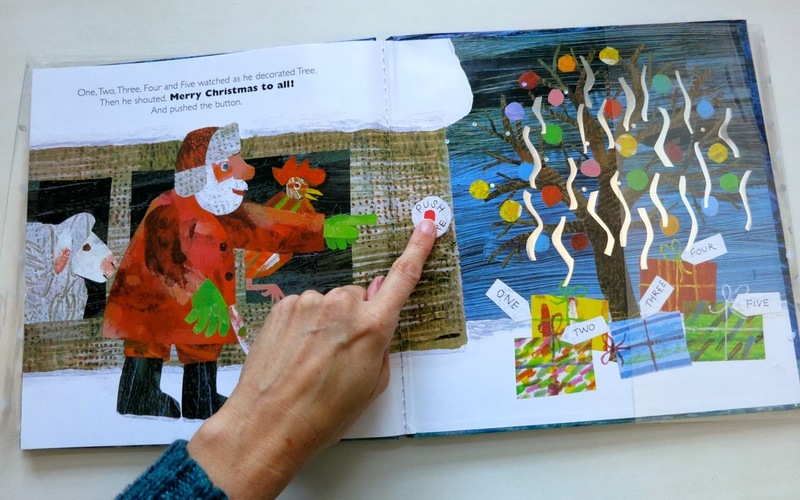 He is often compared to his hero Eric Carle (see below), an accolade he doesn’t shy away from in books like Jonathan and Martha which echoes the theme and approach of the Very Hungry Caterpillar with its use of collage and novelty elements. But Horáček isn’t simply a Carle imitator, he has created numerous beautiful books including Suzy Goose, A First Book of Animals (with Nicola Davies) and now the Mouse series which tell us surprising truths about life. I wanted to know about the stories that shaped Petr’s work, particularly those from his childhood growing up in Prague. When I was a child my father used to read to me ‘Rumcajs’ by Václav Čtvrtek, illustrated by Radek Pilař. The stories were about a shoemaker, who lived in the little Czech town of Jičín. Rumcajs fell out with the local count and went to live in the woods. Rumcajs was strong, he wore a hat made from oak bark and he shot acorns from his ancient pistol. The stories were fun and I liked the illustrations too. Like many of my generation I grow up on truly amazing pop-up books designed by Vojtěch Kubašta. Apart from books we also had lots of very good quality animated films. Here I must mention Jiří Trnka who was one of the most prolific and incredibly talented artists who worked as a puppet maker, animator, illustrator and writer. During Communism many talented writers and artists were unable to publish and exhibit their work. Working on books and animated films for children was often the only way these artists could fulfill themselves and earn some money. Writing for children wasn’t as carefully censored, as it wasn’t considered to be important or dangerous by the ruling communistic government. The artists often wrote and illustrated under different names. I was always a very slow reader and I started to read books quite late in my teens. At high school, where I studied art and design, I was in the company of pupils from artistic and intellectual families. To be able to keep up with the others, I had no choice; I had to start reading books. ‘On The Road’ by Jack Kerouac was one of the books that made me think that reading could be fun. I soon started to read Bohumil Hrabal and Jiří Škvorecký : two great Czech writers and excellent storytellers. Although I have written and illustrated dozens of books only four of them were translated into my native Czech. For many years I wished that this would change and recently my wish came true. A couple of enthusiasts from Prague, who liked my work, started crowd founding and in no more than three weeks raised enough money to publish my very first book written in Czech. It is called ‘Dlouhá cesta’ (The Long Journey). Knowing that the money came from people in my home country who like picture books was a rather humbling experience. The book was released just before Christmas and it makes me very happy. It must be ‘Dream Snow’ by Eric Carle. The book is just a perfect Christmas gift for everyone. The lovely picture book writer Joyce Dunbar gave me a board book copy the other day. I already owned a copy of the book. My version has cellophane pages with painted snow blankets, which covers the animals and a button on the tree in the last picture. When you touch it, it makes a magical jingling sound. I don’t usually like books, which make sounds, but this one is special. It is a Christmas story. I wonder what makes me like the book so much. Well, it is of course the illustrations, but it is also the perfect Christmas feel. I came from the Czech Republic and we had snow every winter. I remember waking up in the morning and before I opened my eyes I knew that snow had fallen. The whole world was strangely silent. I like skiing or walking in the snow, coming home to a warm place nicely tired and falling asleep in the armchair for a couple of minutes just before supper. All this is in Eric Carle’s book. The book that blew my mind as a teenager and the book I still read these days is “The Master and Margarita” by Mikhail Bulgakov. I’ve illustrated a couple of chapters from the book and did lots of drawings inspired by the book, just for myself. I’ve given this book to many people as a present. It was ” The Very Hungry Caterpillar” by Eric Carle. My English friend gave the book to my daughter as a present when she was born. As I was born in communist Czechoslovakia, I didn’t know this book existed. I didn’t know how famous the book was everywhere else in the world, but I realised straightaway that the book is a true masterpiece. I remember trying to show the book to everybody who came to my house and being surprised that everybody knew the book. I still can’t believe that it was published when I was only 2 years old. The book looks as if it was published yesterday. A true masterpiece. My latest book to be published is ‘The Mouse Who Wasn’t Scared‘. It’s the fourth book with the character of Little Mouse. Four books is quite a lot considering that I wasn’t planning to write a series of books. It somehow happened. I suppose I just fell in love with the mouse who is childlike, nosey, always jolly and who makes me smile. I like walking and drawing in the woods. The idea for ‘The Mouse Who Wasn’t Scared’ came to me after going through some of my sketches. The book is about the fact that we all are scared of something. We are scared of very different things from each other. In the book Little Mouse goes to play in the woods. She is not scared of big hairy animals, but…! I hope you will like the story. Tags: Bohumil Hrabal, Dream Snow, Eric Carle, Jiří Trnka, Jiří Škvorecký, Little Mouse, Master and Margarita, Mikhail Bulgakov, Nicola Davies, Petr Horacek, Rumcajs, suzy goose, The Mouse Who Was Scared, The Very Hungry Caterpillar, Vojtěch Kubašta. Bookmark the permalink.